If you want to build a body you can be proud of without having to starve or deprive yourself of all the foods you actually like...eating meals that you look forward to and savor every single day...then these meal plans are for you. What if you didn’t have to obsess over “eating clean” to get lean and healthy? In fact, what if you could transform your body eating “naughty” foods you love each and every week? You don’t need to eat broiled chicken breast and steamed asparagus six times per day to melt fat, add muscle, and feel great. In fact, you shouldn’t follow a boring, bland, “bodybuilder” diet because it’s not a sustainable lifestyle. Eventually, you’ll fall off the wagon, gain back most or all of the weight you lost, and then what? That’s why you need flexible meal plans that not only work, but that you enjoy. Meal plans that help you burn fat and build muscle like clockwork, and that you genuinely look forward to every day. And that’s exactly what you get with the Muscle for Life Meal Plans. Imagine…eating mouthwatering meals every day...never feeling starved or stuffed...having great energy levels and workouts...and watching your body change before your very eyes, dropping fat and adding muscle each and every week. That’s the Muscle for Life Meal Plan experience. 10 different meal plans (with grocery lists!) designed by our in-house nutritionists for losing fat, gaining muscle, or maintaining your body composition. A quick start guide that explains exactly how to use your meal plans to make your transformation as simple as possible, including how to shop, cook, and store food like a pro. A supplementation guide that explains which supplements will help you achieve your goals faster. A “reverse dieting” guide that explains how to transition from your meal plans back to “normal” eating (once you’re done losing or gaining weight) without gaining back any of the fat you’ve lost or losing any of the muscle you’ve gained. An FAQ that answers the most common questions people have about diet and fat loss, muscle gain, and more. Our VIP customer experience team who is available to answer any and all questions you might have. Our “Love It Or Leave It” 100% money-back guarantee that fully protects your purchase and guarantees your satisfaction. Getting Started With Your Meal Plans is Just as Easy, Too. 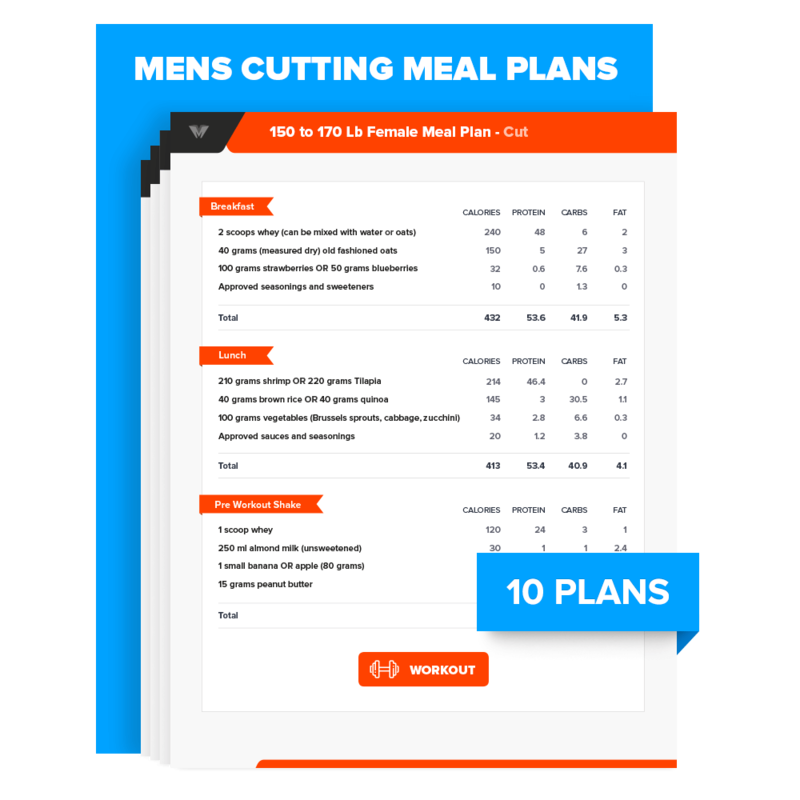 After placing your order, you’ll get immediate access to 10 different meal plans tailored to your gender, weight, and goals. All you have to do is find the plan that looks best to you, print the grocery list, go shopping, prep your meals, and voila, you’re ready to start your journey toward a leaner, stronger, healthier you! As you’ll see, four of the meal plans are designed specifically for people who work out in the evenings, four are designed for people who work out in the mornings, and two are designed for flexible workout times. There are even plans designed specifically for fasted training! Each of the meal plans also provide different types of food, meal sizes, and meal compositions, which makes it even easier for you to find a plan that you’ll love. I hate when people and companies tout money-back guarantees that are hidden with "gotcha" clauses. For example, here's something you'll find with many personal trainers and nutritionists: "If you follow my instructions for X days and aren't satisfied with the results, you get your money back." And then, if it comes to actually asking for your money back, you get to start arguing about how precisely you actually followed the instructions. You're either thrilled with your meal plans and results or you get your money back. If, at any point in your journey, you're unhappy with the plans or experience and we can't turn that frown upside down, I will refund every penny you paid. No forms to fill out, no forms to mail in, and no having to prove or disprove anything. There are NO strings attached. That’s how confident I am you’re going to love your meal plans and how they work for your body. What kind of results can I expect from the meal plans? If you’re dieting to lose fat, you can expect to lose around one to one and a half pounds of fat per week. You could lose slightly more or less than that depending on how much you weigh, your activity levels, and how closely you follow your meal plan. If you’re dieting to gain muscle, you can expect to gain around one half to 1 pound per week. You could gain slightly more or less than that depending on how long you’ve been lifting weights, your activity levels, and how closely you follow your meal plan. How long can I follow the plans for? Most people will see steady, consistent improvements in their physique for at least 3 months, losing up to 20 pounds or gaining up to 12 pounds in that period. Eventually, results will slow down, but all you need to do to keep the needle moving is make the appropriate adjustments to your plan or get one-on-one help through a service like my diet coaching. What if I want to lose fat and gain muscle at the same time? Which plan should I choose? Choose meal plan for cutting. When you’re new to weightlifting (or proper weightlifting), your body is hyper-responsive and can gain muscle at a very fast rate. During that time, you can build muscle while losing fat. This only lasts around 6 to 12 months, though. After that honeymoon period is over, you’ll no longer be able to gain much muscle and strength while in a calorie deficit because the physiological processes and produce more muscle and strength are impaired when calories are restricted. From this point on, you’ll need to use cutting phases to lose fat, and lean bulking phases to gain muscle and strength. What if I don’t like any of the 10 meal plans provided? Shoot us an email at [email protected] and we’ll help you out! We’ll work with you to find the right food choices that will work best for you, so you have at least one meal plan that you’re confident you can stick to. Do you plans for vegans or vegetarians? Not yet, but they’re coming soon. That said, with a few substitutions, all of our omnivorous plans can be easily turned into vegetarian or vegan plans. What if I work out more than once per day? Shoot us an email and we’ll help you out! Typically, all you have to do is move one or two meals to accommodate your second workout, but you can often time your workouts in such a way that you don’t need to modify your meal plan at all. I’m not sure which weight range I should choose. Help! Choose the weight range that’s closest to your current body weight. For example, if you weigh 173 pounds, choose the meal plans for the 170 to 190 pound weight range. If you’re between weight ranges, choose the one that’s just below your current weight. For example, if you’re 170 pounds, choose the meal plans for the 150 to 170 pound weight range. What if I have questions or need some help? We’re not satisfied until you are, so we’ll do whatever we can to make sure you’re happy with your plans. What if I have a special needs due to pregnancy, breastfeeding, or a medical condition? If you have special needs, then you should speak with a doctor before following anybody’s meal plans, including ours. None of these plans are meant for people who are pregnant or breastfeeding, or who have medical conditions like diabetes, thyroid disease, or metabolic or eating disorders. While we’d love to help, these issues are simply too complicated and important to be dealt with over the phone or email.